The San Francisco International Airport showcases some surprising, serious art. On my way from the arrival gate to ground transportation, I encountered a big Jay Defeo painting. A Wayne Thiebaud and a Robert Bechtle followed. Ned Kahn’s Wind Portal, a genuinely cool site specific installation, surrounds travelers passing between BART and the Air Train: little metal discs, looking like oversized pixels, catch the swirling air currents and the light, creating a shifting index of the atmosphere. I expect it’s a crowd-pleaser. Looking at the full list of public art on display, I see much I’m sorry to have missed. Public art’s often a funny thing: risking attack as patronizing cultural elitism on the one hand and dismissal as pandering on the other. It can be funny in other ways, too. 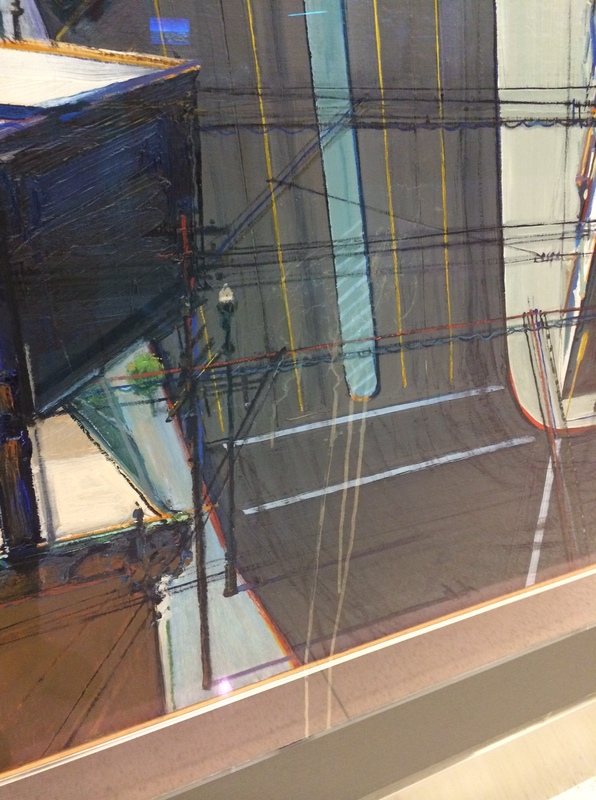 Check out the Thiebaud, 18th Street Downgrade, 1978. I’m a sucker for this kind of perspective, a hallmark of many Bay Area Figuration landscapes (and, I suppose, a feature of the city): a strong, nearly unimpeded linear movement through space alongside the repeated stutter-steps of overlapping forms. Here, some dried liquid – milkshake? heavily creamed coffee?– has left smeary marks and dun drips on the plexi’ box surrounding the painting. The intervention highlights the marked verticality, unusual for a landscape, even as it mimics Thiebauds lines. Of course, it also conjures up another body of work the painter is famous for: thickly slathered pictures of desserts. It’s not quite tagging Guernica, but it could function as fun criticism.